The dust storms that swept through places like Broken Hill today have been showing up well in the specially-enhanced dust imagery from the Himawari-8 satellite. The CAMS dust products are still trying to advect some dust haze over SEQ by tomorrow evening, lingering through Friday and then possibly again around Sunday but its concentrations (<75 micrograms per cubic metre and aerosol optical depths that aren't TOO bad) are more suggestive of a dust haze rather than a full blown DS. That's if it even reaches us. I did see some talk earlier about rainfall and the dust - one thing to note is that most of the first lot of dust haze looks to be in the clearer air in the westerlies behind the rainband so I don't think the rainfall will help wash it out of the sky as far as our region goes. Will have a look at the rainfall, winds, soil conditions and instability west of us to see if any additional dust will be kicked up or not. 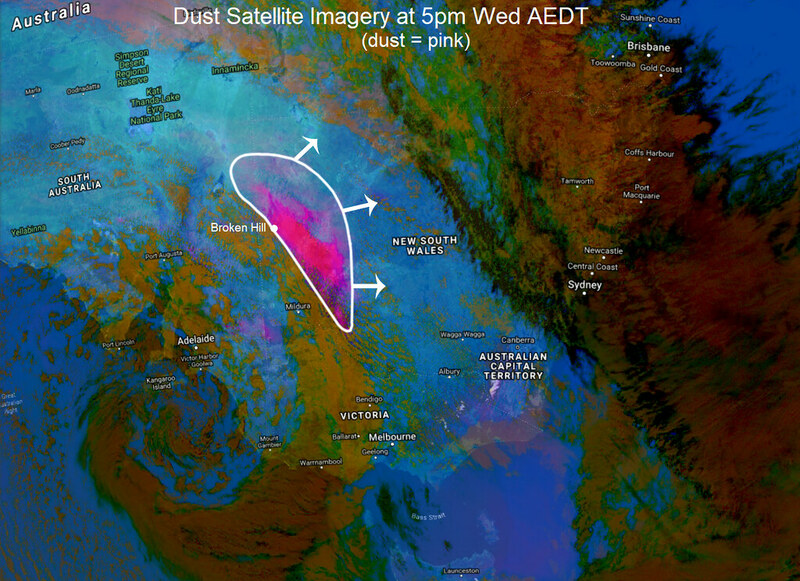 Thanks for the map Ken, I'm presuming this dust chart is only exclusive to the BOM? Heavy rain and big gusts here. Also a very strong smell of dust. Rain delay for the cricket at the gabba now. Not too far from here plenty of lightning now. Just skimmed us here, didn't manage to drop anything. We should get something through the night though. half that for us here at Salisbury, 3.9mm to be precise. Breif downpour here with 8mm in the bucket. Nice start to this event, hopefully a bit more to come o'nite. Only about 2.5mm here so far, fingers crossed more to come. Just moved to Tewantin from the South Coast NSW. Decided after a long time I’d go for a chase, ended up in Dalby to a very short and sharp storm around 3pm. Caught another one at Nanango. Bothe were very short lived. Seems that they were breaking up just west of the ranges north of Toowoomba. Alas, tomorrow is another day. Bit too late to post up shots of the structure, it then again it was very disorganised. Not much to look at. 870kms later, I’m hoping for something worthwhile tomorrow. Access - C has activity over the SE QLD region late morning and early afternoon before clearing. I'm hoping some of the high cloud sticks around at sunset, could give off a awesome red sky, considering it will be clear out west later on. The dust mass chart forecast on windy has dropped values on the latest runs. Strangely though, Sydney's forecast is for raised dust, yet there values are way lower compared to northern NSW / Southern QLD. I'm not too sure if there are other models that forecast dust, other than the one on Windy. Maybe those values will come on the way of storms later on? There is a small rain band just east of Warwick, appears to be heading to the southern area's of SE QLD - Gold Coast etc..
" Very high (90%) chance of showers or patchy light rain and the chance of a thunderstorm, clearing during the afternoon. Chance of any rain: 90% "
When the rain clears and whatever totals eventuate, whether it has been less or more than forecast, there is one thing to consider. As others have pointed out, there is going to be a highly unusual(probably not unprecedented), extended period of hot dry westerlies. When it finally ends, what is going to come afterward? 8 registered (ashestoashes, crikey, Ben K, mysteriousbrad, LonnyDave, Adaminaby Angler, Aussea, 1 invisible), 66 Guests and 3 Spiders online.